One of theunearthed headstones at Calvary Cemetery. Another 600-900 headstones are estimated to remain burried. Waltham News Tribune. An estimated 600-900 neglected and forgotten Famine-era graves were discovered in Massachusetts in September when Rhode Islander Annie McMullen was attempting to trace her husband’s Irish ancestry in New England. McMullen’s journey to discovery began several years ago when she became interested in learning more about her in-laws’ journey from Ireland to the U.S. She soon learned that her husband’s great-great-grandfather and three brothers came to the U.S. during the Famine, and that shortly afterwards one of the brothers died in a freak accident and was buried in the Irish Catholic Cemetery in Waltham, Massachusetts. But when she went to the cemetery, it was gone, replaced by a school, a new church, and residential housing. “I began to wonder about all the individuals who have been searching their Irish family history and have not been able to find where their family members are buried,” she said. Eventually, she uncovered a news report that the graves in the cemetery had been reinterred in the city’s Calvary Cemetery following an agreement between Waltham and the Archdiocese of Boston in 1947. But when she went there, all she encountered was a field with a few headstones. “That seemed odd, this big grassy area and only four headstones,” she told the Waltham News Tribune. So she took to excavating on her own, and discovered, under a few inches of topsoil, grave markers for immigrants from counties Cork, Kerry, Donegal, Galway, and more. Thank you so much Sarah for your interest in the article! A follow up article was published in the Waltham Tribune after our first work weekend during which we successfully unearthed 161 headstones of Irish immigrants. We are now in the process of having the area scanned with ground penetrating radar and 3-D Scanning which will allow us to determine the number of burials and also locate additional headstones that are buried deeper. This will be performed on October 31st, 2015 and will be an all day affair. The headstones that we have unearthed are all in very good condition and many document both the parish and county that the individual(s) came from. The majority of the individuals came to the States during the famine years with deaths ranging between the mid 1840’s and 1913. A report filed with the town in 1947 stated that 1395 bodies were removed from the Church Street Cemetery and reburied at Calvary. The Waltham Tribune will also carry an article after the ground scanning is performed on the 31st. We have also set up a Go Fund Me site to help raise the funds for the scanning and you might want to follow the progress and my updates on this as well. Thank you for all your interest in this project. We are very glad to be bringing these long lost individuals back into the light and making their names known. Wonderful work. Thank you for myself and I’m sure the many who hail from the area with ancestors from Ireland. I’m from Cambridge and fortunately I know the grave sites of my Murphy, Sullivan, Mulcahy, Costello grandparents that came from Galway and Cork. Thank you so much John for your interest in the article! A follow up article was published in the Waltham Tribune after our first work weekend during which we successfully unearthed 161 headstones of Irish immigrants. We are now in the process of having the area scanned with ground penetrating radar and 3-D Scanning which will allow us to determine the number of burials and also locate additional headstones that are buried deeper. This will be performed on October 31st, 2015 and will be an all day affair. Interestingly, some of the stones that we did unearth contained the surnames of Costello, Sullivan, Murphy and Mulcahy so I am wondering if any of your ancestors might have been buried in the Irish Catholic Church Street cemetery in Waltham. Just for your interest, the church street cemetery was one of the very few in the Boston and Greater Boston area that was primarily Irish Catholic. Many of the individuals who were buried there resided in Cambridge, Boston and other towns surrounding Boston thus it is quite possible that one of your ancestors might have been buried there. the Waltham Tribune carried the follow up article regarding unearthing the headstones and will also carry an article after the ground scanning is performed on the 31st. We have also set up a Go Fund Me site to help raise the funds for the scanning and you might want to follow the progress on this as well. Thank you so much for your interest. This project has been a long time coming and in the planning. Looking forward to the complete listing of names. I got some real bad news for you people. Unless those folks were buried in concrete or brass coffins, there would be nothing left to move BUT the headstones. 150 years passing don’t go too well on wood buried in the ground. A handful of brass coffin handles and a few teeth, perhaps, is all you will probable find after that much time. .
HI Ehren: The individuals who were moved in 1947 were indeed buried in wooden coffins many of which were intact (per eye witness accounts and also one of the men involved in moving the bodies during the summer of 1947). The names of individuals were still noted on the original coffins, however, the decision was made to have smaller coffins built and the bones from each grave placed within the newly constructed coffins. The gentleman who worked on actually removing the bones from the original coffins stated that there were, indeed, many bones still in very good condition at the time of the move. Another woman whom we met this weekend also witnessed the removal of the bones from the original coffins and graves (some coffins had deteriorated but not to that extent). The great majority of the individuals died between 1850 and 1922 (last burial being in 1922) – the removal of the bodies was performed during the summer of 1947. annie (we are the ones spearheading this project and have talked to several eye witnesses to the 1947 work as well as to a worker who was directly involved) News articles from the summer of 1947 also state that the original coffins were intact and bones were transferred to the newly constructed coffins. Just read a article in the Irish central website, Hiw did your project go and did you compile a list of names from the headstones?? My apologies for not responding to your inquiry so much earlier than this. Today (09/03/2017) I received another message from “Nicole” who was inquiring as to whether a list of the names of the deceased has been published yet. Below is my response to her this evening….I do apologize for the long delay in not posting a follow up to the project but hope you will understand why when you read the following. It has been a difficult couple of years for us. Hoping to get back on track this fall/winter as we do hope to be in the new house by the end of the year. Hi Nicole: I replied earlier today from my mobile phone but not sure my response went through. I am Annie, the gal who started this project with my husband, Bill. Long story short…the project is still ongoing. Shortly after we and a number wonderful volunteers unearthed the headstones my mother became very ill with congestive heart failure — she declined over a period of 8 months and passed in June 2015. Then my dad became ill – recouped but then we decided to build a house with him to bring him to live with us – while that was ongoing (and something which has taken an enormous amount of time …which I will never ever do again) my beloved dad passed away suddenly in November 2016. So….the past year has been spent settling estates and financial matters, packing and trying to sell his condo, continuing on with the new house after putting it on hold (still not done) and repairing/packing our current house. Needless to say, we have had little time to concentrate on much else — I also operate my own medical-legal consulting business which I have not been able to work at to the degree I had previously. On a BRIGHT note, however, just about 3 weeks ago I started back in on the project – started to transcribe all the headstones which had been photographed and am back in contact with some of the volunteers who had so kindly helped me with this project. We are in the process of getting reorganized so as to get a complete list of names published and also have the Catholic diocese erect a monument to these Irish Catholics. If you have some ancestors whom you might think were buried in Waltham please send me their names and I will check the photographs that we have. I do apologize for this long delay….it has been a difficult two years for us. Bear with us please. Annie *(and Bill). Has the list of graves ever been published.? Hi Nicola: this is annie … my husband and I are the ones who started this project. Long story short … shortly after we uncovered the headstones my mom became ill and passed away … then my father would become ill and he passed away as we were in the process of building a house with him. The past year we have been bogged down in settling the estate, completing the new house, selling his condo and repairing and selling our house and I am still operating my own consulting business. Just a couple of weeks ago we actually started to relook at the project so as to resume work. I do have all the headstones photographed and we must now do the transcriptions. If you think you might have ancestors in Waltham please let me know and I will check the headstones. Please keep in touch. I am hoping to post an update on the project before too much longer. Annie. Contact me at. Bramasole@cox.net. My ggrandmother was a Catherine Rochford married to a Michael Daly in Dunmanway, co Cork. All the Rochdords seem to has disappeared and I think they went to the States during the Famine! 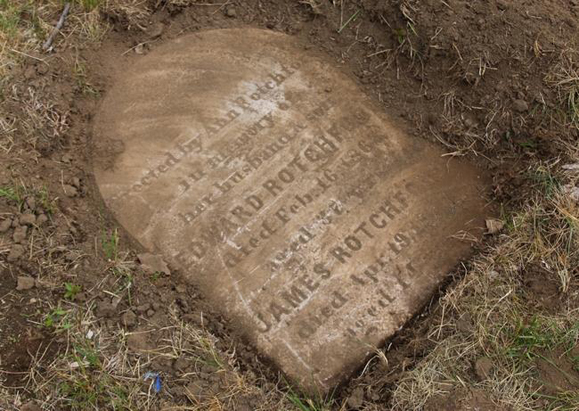 Do you have any Rochford headstones in your archives of the project! Erected by Ann Rotchford in memory of her husband and son Edward Rotchford, died February 16, 1862 aged 32 years; James Rotchford died April 19, 1874 aged 14 years. Might these be any of your ancestors?? Hi Annie, I am looking for John J and Mary J Leahy. He was from Cork and I believe she was a Hughes from Waltham. Also looking for their son, Thomas Leahy who passed in 1916. They fit all of the parameters for those who would have been buried in the Irish Catholic Cemetery. I have been unable to locate them interred in any other place. Hi John: No, unfortunately, the Radar scanning did not find any additional markers. They only found one which we had not uncovered. Nothing on the opposite side of the field. We were informed by Mr. Antico who was working with his dad during the disinterment and reinterment that the workers discarded many of the headstones in the woods or “in a pile” that they broke during the move. I have a feeling that if the woods across the street were excavated we would find many markers – although broken. I am looking for my gr grandfather, William Welsh died abt 1890 and his wife Ann McNamara Welsh died abt 1866. I’d love to know if they are buried there as they lived very near the church. HI Kathleen: Not sure if my prior reply message was successfully transmitted so am sending a second one. I am so happy you found us and I am going to check this evening for your ancestors – their dates of death would have made it likely they would have been buried in the Catholic Church Street Cemetery. I will get back to you shortly. HI Kathleen: On first look I do have a few McNamara’s but no “Ann” – here are the McNamara’s I do have who may be a part of your family: Timothy McNamara died June 27, 1871 (or 1874 – difficult to read date on headstone) – aged 68 years; Hanna McNamara died April 1, 1876 – aged 9 yrs, 11 months; and Honora McNamara died May 19, 1877, aged 18 years, 5 months. I also have a Mary Miles Welsh born 1826 died 1901. Will keep looking through the headstones! HI Kathleen: The only individuals I found we had uncovered were those with the surname “McNamara” who may be related to your Ann McNamara. The headstone is in pristine condition and reads as such: Erected by Honora McNamara in memory of her beloved husband, Timothy McNamara Died June 27, 1874 Et. 68 years. Native of parish of Ahena, Co. Cork, Ireland. Their daughter Hannah, died April 1, 1876 Et 9 (possibly 19 yrs) yrs, 11 months, Honora died May 19, 1877, Et. 18 years, 5 months. HI Kathleen: So good to hear from you and happy that you have found this site. I am going to check my database this evening and will get back to you shortly! Hope I have one of yours in the database.